Evolution? It doesn't add up! Original title in German: "Evolution? Das ergibt keinen Sinn!" 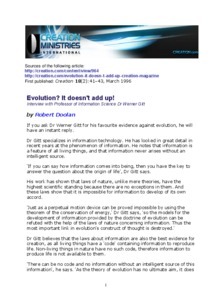 If you ask Dr Werner Gitt for his favourite evidence against evolution, he will have an instant reply.